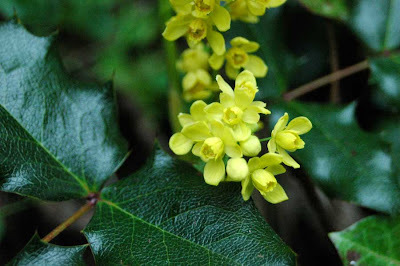 Oregon-grape, Berberis aquifolium. There are two similar species in the region (Tall Oregon-grape (aquifolium) and dull Oregon-grape (nervosa)), and I'm pretty sure this is the former but I'm not at all confident in my ability to tell them apart. Even though I think of it as more of a shrub, Oregon-grape is the state flower of Oregon. The easiest way to identify this plant as oceanspray (Holodiscus discolor) is when it gets its characteristic white clusters of flowers which should burst forth in a couple of weeks. I could identify this one because the dried up flowers from last year were still attached to the plant. 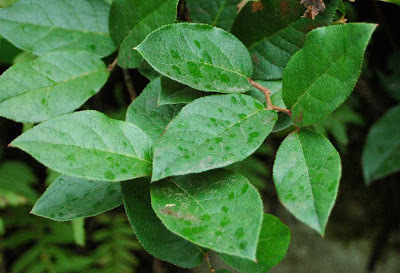 Salal (Gaultheria shallon) is one of the most abundant shrubs in the Pacific Northwest coastal region. It's distinct with its leathery, evergreen leaves, and really looks like it belongs when its covered with the drizzle of a few raindrops as in this photo. 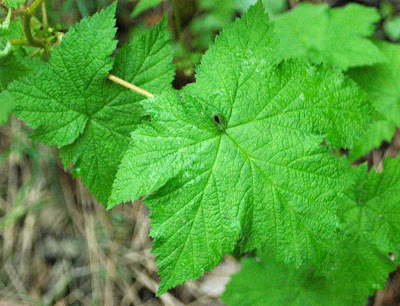 Thimbleberry (Rubus parviflorus) is also affectionately known by some as "nature's toilet paper" since the leaves are so soft. The berries are tasty, but few and far between, so you usually only get to sample one or two at a time. They're also pretty mushy, so it would be hard to collect them in any abundance anyway. 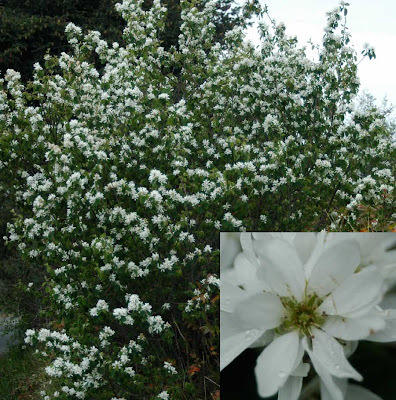 This plant is Saskatoon (Amalanchier alnifolia), and boy did it stump me for a while. By far the most difficult ID for me in this posting. Now that I've figured it out, I notice these beautiful blooming shrub-trees everywhere. 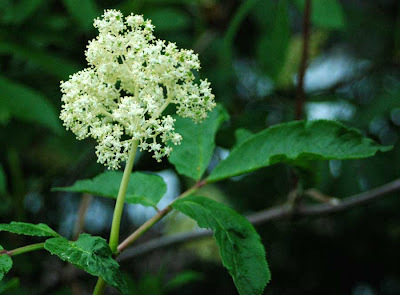 This one, red elderberry (Sambucus racemosa) is a tree I easily recognize because there were two of them in my parents' backyard growing up. I never thought you were supposed to eat the berries, but apparently they are edibile if you cook them first, as the native people did. This photo doesn't really do the Pacific madrone (Arbutus menziesii) and its beautiful papery red bark justice, but it does show how right now these trees are in full bloom all over the island. Like salal, this tree has evergreen leaves. In a few months, these blooms will turn into clusters of red berries that are a popular snack among birds. 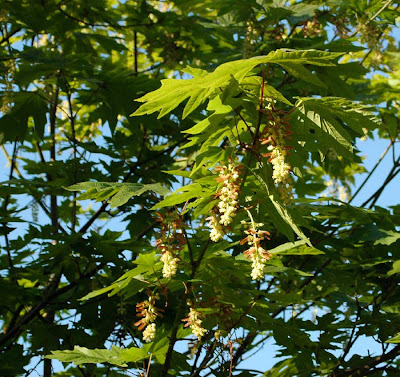 The bigleaf maple (Acer macrophyllum) leaves are getting larger every day, making them look much more familiar than the early-spring version of this tree with tiny leaves and huge clusters of dangling flowers. 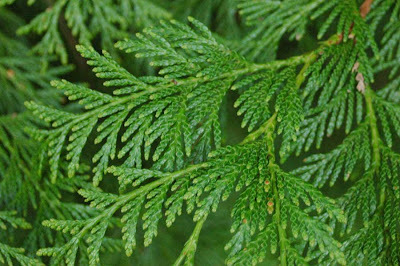 The wetsern redcedar (Thuja plicata) is known as "the cornerstone of Northwest Indian culture" because it was so widely used by local tribes. 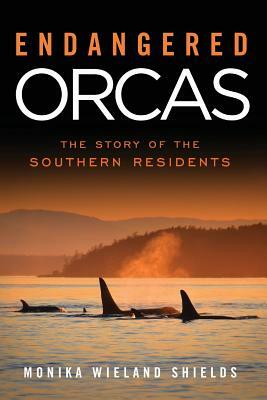 They built virtually everything out of its wood and bark, from canoes and houses to baskets and fishing floats. 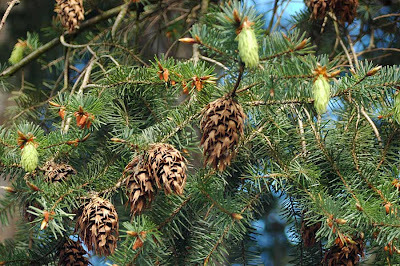 The Douglas fir (Pseudotsuga menziesii) is probably the most common local tree. 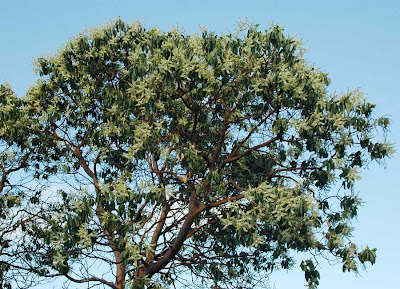 It's characterized by thick bark (allowing it to better survive forest fires than some of its aboreal counterparts) and is one of the most sappy trees in the region (as in covered with pitch, not as in cheesy). 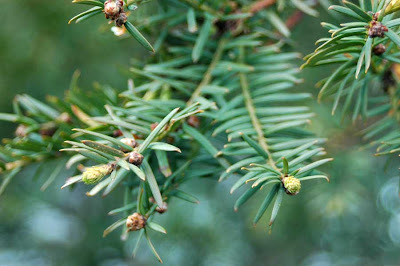 The Pacific yew (Taxus brevifolia) is described in one of my field guides as being a "shy" tree, if trees are capable of being shy. I found this description accurate because I almost missed this tree's presence entirely. It's a relatively small, slow-growing, nondescript conifer that really does just blend into the background. 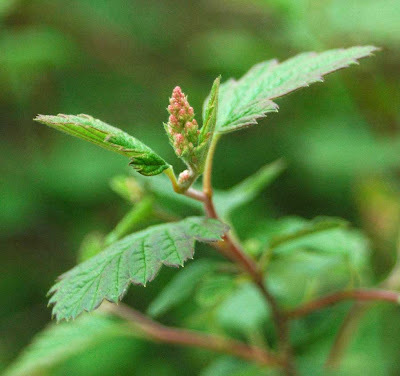 It is, however, very famous for the discovery of taxol in its bark, which is a promising anti-cancer drug. As you might imagine, none of these plants are common to me, living all the way over here in Ohio and all. They are all very lovely. Your picture of the thimble berry makes me look forward to all the wild black berries that we'll be able to pick in a few months. They grow in abundance in the woods across the road from our house! Mmmm...we have lots of blackberries nearby to. The most abundant are the non-native Himalayan blackberry, but they sure to make for tasty grazing and scrumptious pies! I grew up in Saskatchewan, and I miss the Saskatoons dearly. They grew wild all over the valley behind my parents house and along the edges of the ravines in the fields my dad farmed. I had no clue they grew here as well, so now I will be keeping my eye open! I would love to get my hands on some of the berries and make a crisp. I thought the thimble berries were called salmon berries? Never mind about the salmon berry vs. thimble berry, I learned the difference now! I was wondering if saskatoon grew in Saskatoon....thanks for confirming that it does! They must be beautiful to see edging a ravine...and I had no idea they would yield tasty berries! Well if your saskatoons are the same as my saskatoons then yes, they are yummy! They make nice pies and tarts and jelly. I am going to stalk the bushes out behind my house that look an awful lot like the one you posted a photo of and see if it yields tasty berries or not.